* Imagine you have data on prices for many products. 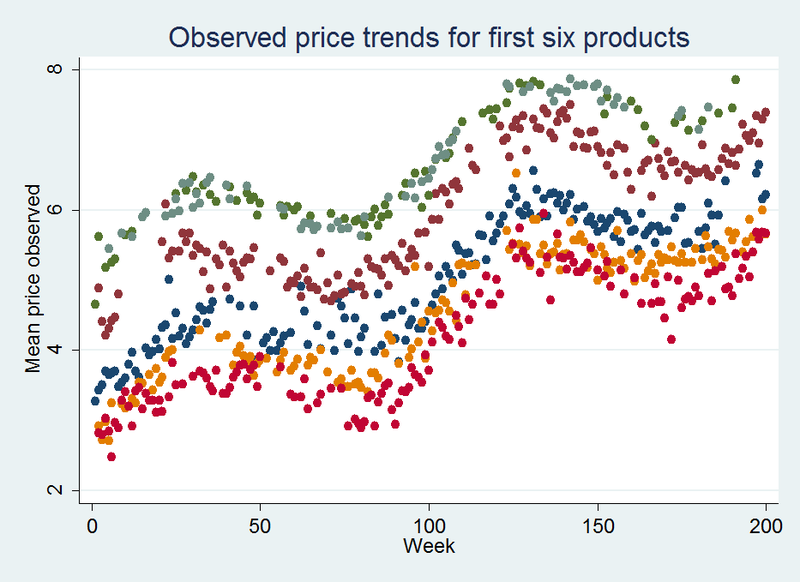 * For each of the products you record weekly price information. 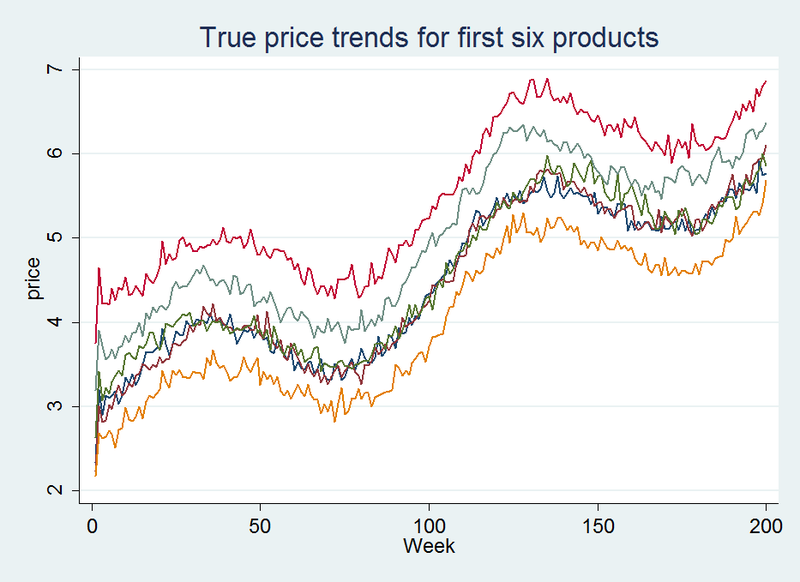 * You have data on weekly prices for 200 weeks. 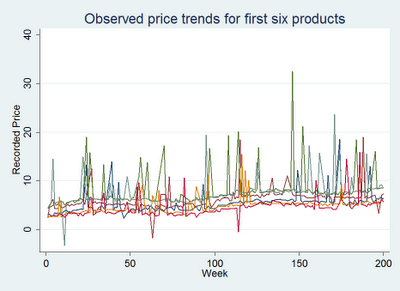 * Now let's imagine that the above generated data is the true price information which is fundamentally unobservable. 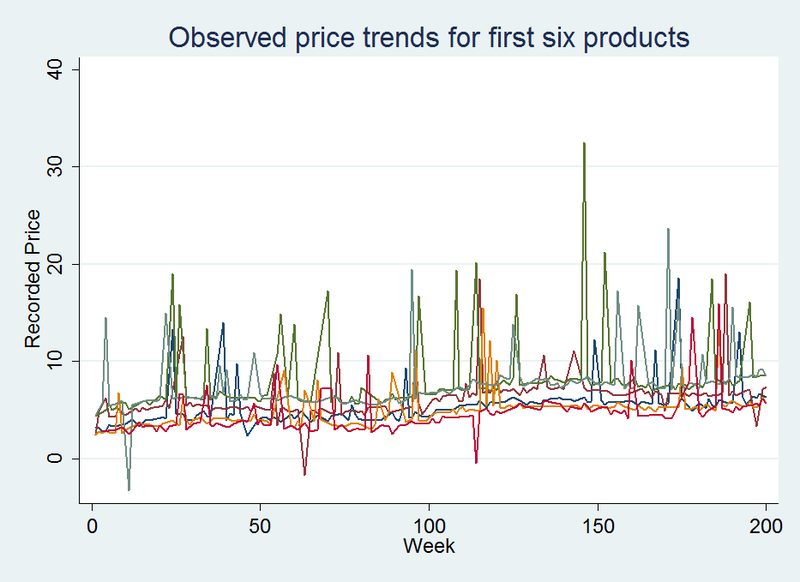 * Instead you have multiple collections of data per week on prices which each vary by some random addative error. * However the price information that you have has some entries that 10% have been mistakenly entered wrong. 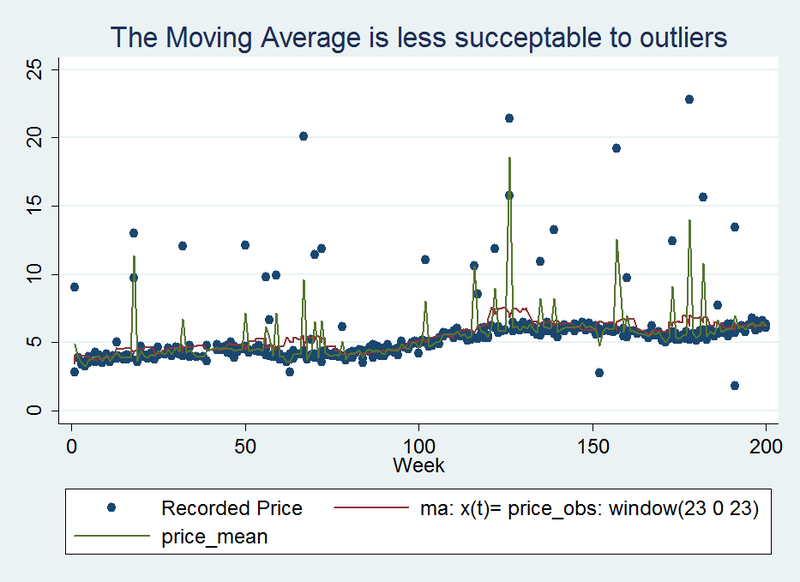 label var price_obs "Recorded Price"
* I am keeping entry error in the data set as a means of comparison though it would not be directly observed. * Can you now with this messy data recover price data that is similar to the original? * The first thing that we should exploit is the duplicate recorded data. 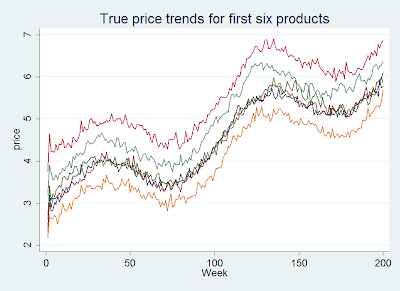 * It is easy to see individual deviations but we do not want to go through all 200 products to identify individually price outliers. 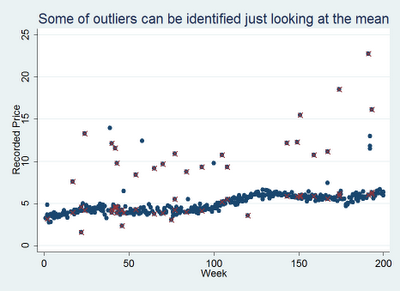 * We want to come up with a system to identify outliers. 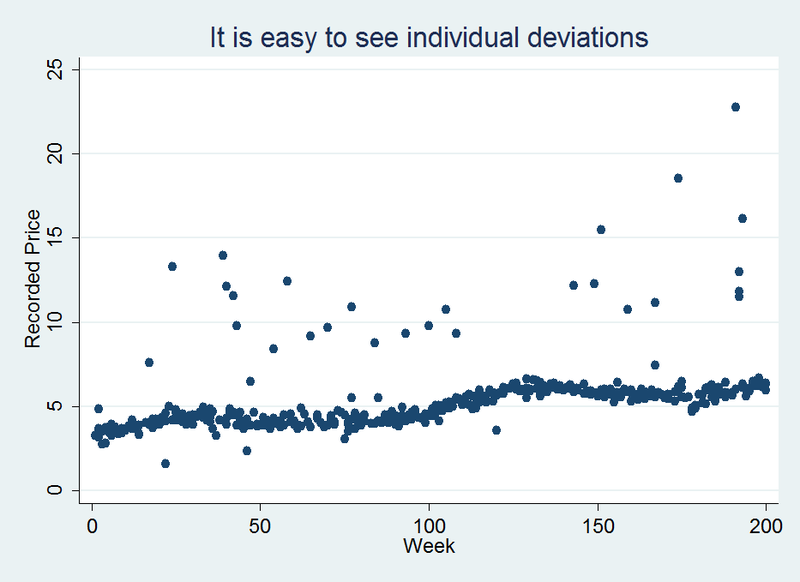 * Let's flag any observation that is 120% greater than the mean or 80% less than the mean. 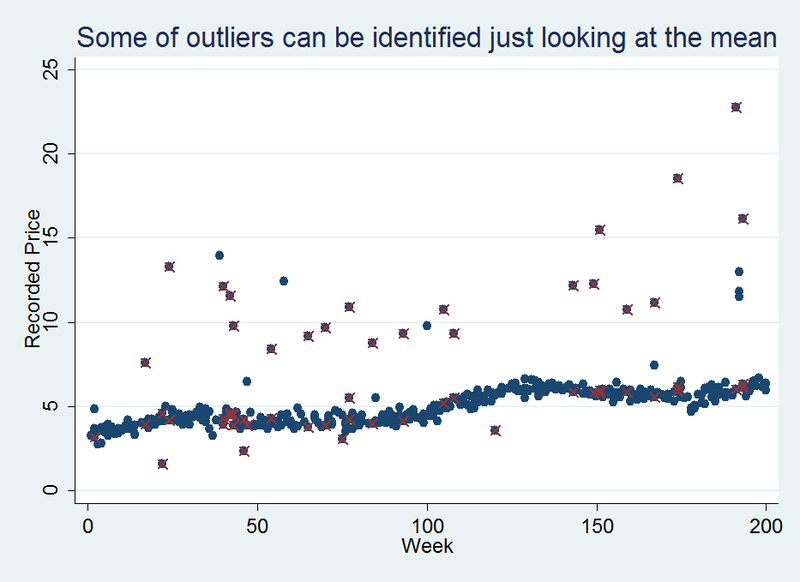 * Our flag is correlated about 45% with the entry errors. This is good but we can do better. * I propose that rather than using just the mean that we construct a moving average of prices and see how each entry deviates from the average. 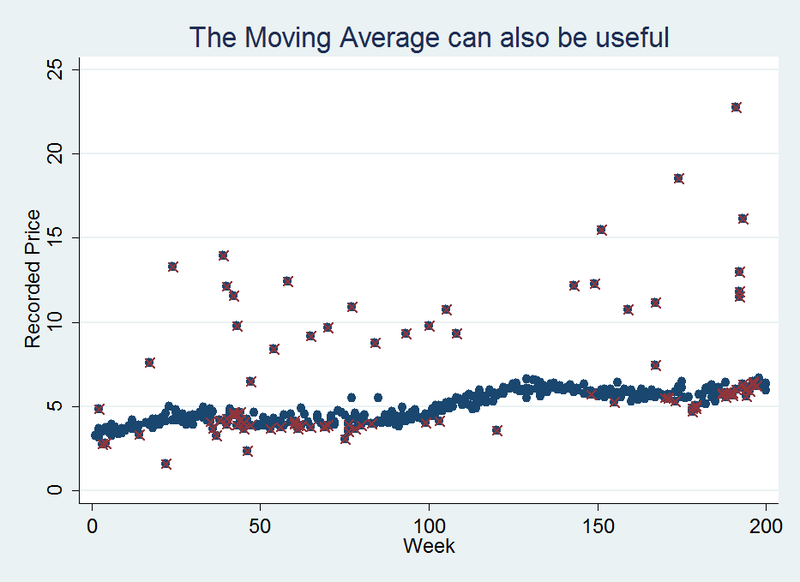 * The only problem is that the moving average command requires xtset and that requires only one entry per time period. * So, I say we rescale the time variable and add in as if recorded at a different time of the week the observation number. * We need to newly generate prod_obs since we do not know which observation is missing from each product. 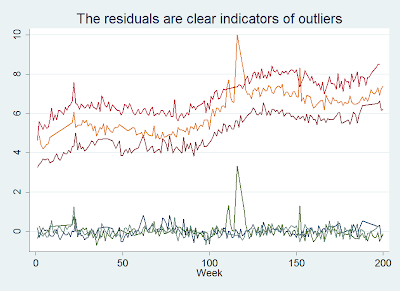 * xtset sets the panel data panel id and time series level. 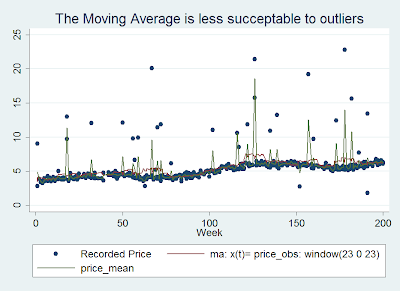 * The command we will be using is "tssmooth"
* It is coded such that by specifying ma it means moving average and window tells Stata how many time periods to count ahead and how many behind in the moving aerage. * This command can take a little while. 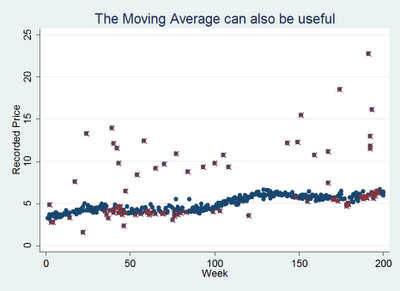 * The moving average is more stable than just the time average. 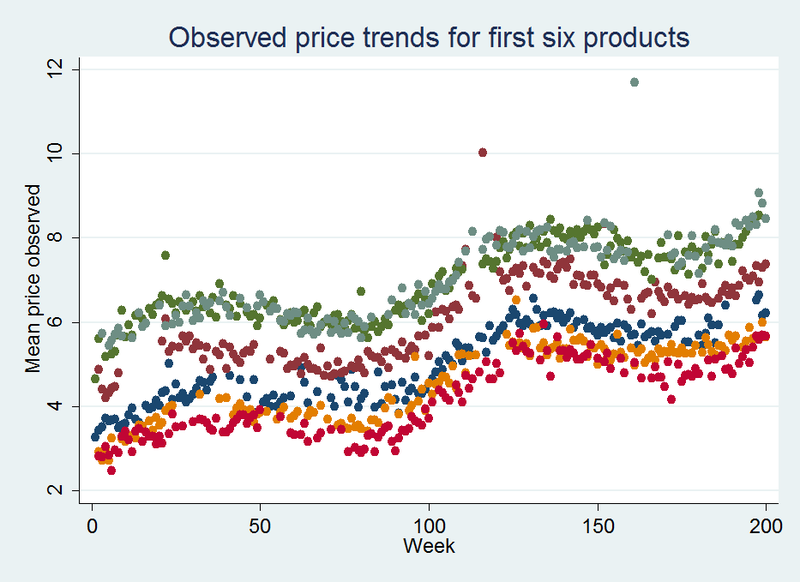 label var price_obs "Mean price observed"
* The data is looking a lot better but we still clearly have some unwanted outliers. 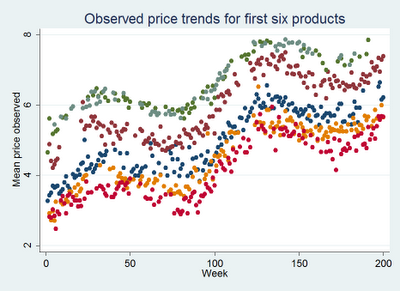 * We could take advantage of the cross product trends to help identify outliers within product prices. * Finally, let us drop observations with residuals that are greater than 1.5 standard deviations from the mean. 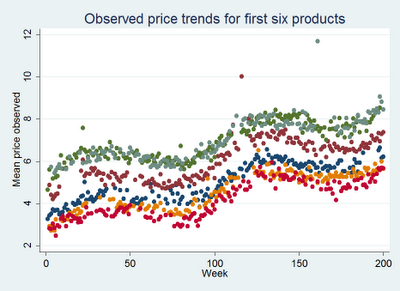 * Plotting product 1 pricing relative to outliers. 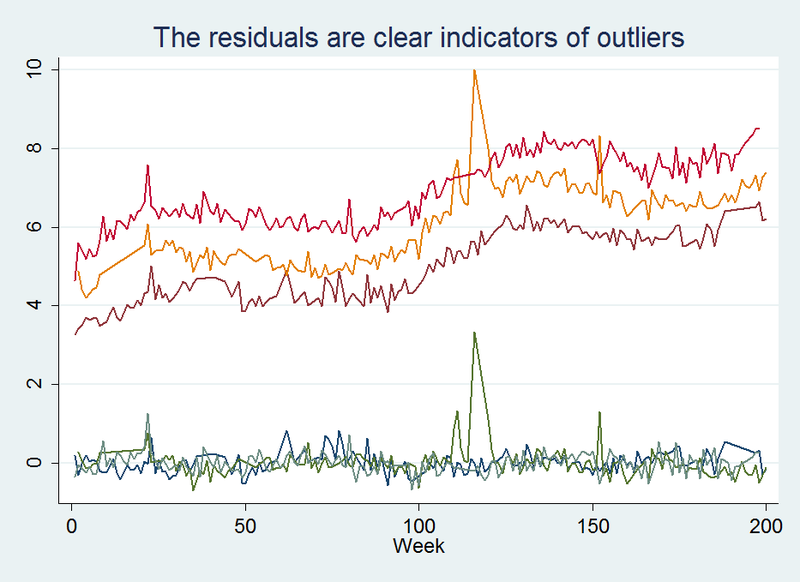 * Not as clean as our first graph but definitely much improved.